On being detailed for a trip to Laos, I was rather pleased as it was one country I could hardly ever think of visiting. A small delegation led by the then Foreign Minister, Mian Khurshid Kasuri, and including a few officials from the Ministry of Foreign Affairs and the armed forces, was scheduled to participate in the ASEAN Regional Forum (ARF), a sideline to the 10th ASEAN Formal Summit in Vientiane (pronounced ‘viangchan’), the capital of Laos. I briefly wondered how on earth had Pakistan had been able to demonstrate that, ‘it had an impact on the peace and security of Northeast and Southeast Asia and Oceania’, to qualify for ARF membership, but that wasn’t my concern, really. Perhaps it had to do with keeping up with the Joneses in the neighbourhood. I was glad that I could learn more about Laos People’s Democratic Republic regarding which, I knew little more than the fact that it was one of the last surviving bastions of Communism (though nominally), besides being the most bombed country, per capita, in the world during the Vietnam War. We took a PIA flight to Bangkok, from where a Lao Airlines ATR-72 picked us up for a short flight to Vientiane. Prompt in-processing at the Wattay International Airport was followed by a leisurely drive to Novotel Hotel where our delegation was staying. Traffic on the well-maintained roads was sparse, largely due to low car ownership; motor cycles, bicycles and rickshaws (locally known as tuk tuk) were the principal means of transport. After checking in at the hotel, I took a short walk to sample the sights and sounds of the placid city that had seen many an upheaval in its tumultuous history of foreign occupation. 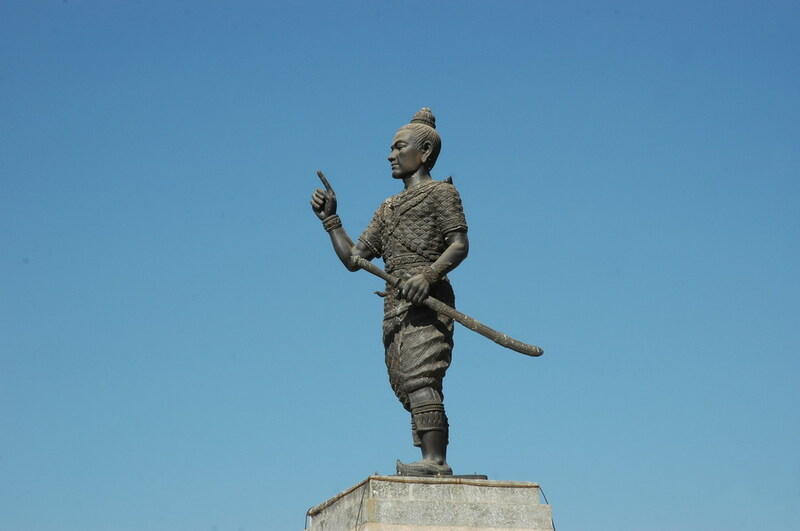 Just near the hotel, a statue of Fa Ngum, a ruthless 14th century warlord and founder of the Kingdom of Lan Xang (million elephants) – precursor to what is now Laos – stands menacingly, clasping a huge sword in hand. The road is named after his son and successor Samsenthai. As I walked down the road towards downtown Vientiane, I came across someone looking like our own countrymen, idling outside a shop. Indeed he was a Pakistani, which came as a surprise to me, as salaams were exchanged. He introduced himself as Gulzar Khan who owned a travel agency. He surprised me even more when he told me that about 100 Pakistanis are settled in the city, of whom the younger ones are mostly married to local girls. This matrimonial arrangement provides permanent residence to the Pakistani youth, while the local girls get to live in much better conditions than their less privileged counterparts. Another fellow Pakistani, Somboune Khan, originally from Haripur, emerged from somewhere and introduced himself as a director of a thriving garment import-export company. He also represented the Muslim Association in Vientiane. Both the Khans gave a good rundown of the city and its people and, helped me with some of the must-see places during the short time I had. We again met next evening when the two gentlemen, along with some Pakistani residents, came to call on the Foreign Minister at the hotel. Walking by the roadside, I spotted a drab colonial building that houses the Revolution Museum. A rather modest affair, the museum covers the country’s struggle against the French when it was ruled as part of French Indo-China (1893-1953). Some heroic pictures of the Vietnam War showing ‘patriotic guerrillas fighting US imperialists’ and, memorabilia of the 1975 communist revolution spearheaded by the Pathet Lao (who ousted the royalists), are also on display. Incredibly, items like socks worn by Politburo members when they escaped from prison, also find a place of honour! The furniture and display boxes for various artefacts were rather worn out and the explanatory labels were on handwritten paper. For a full hour of my stay, I was the only visitor, which said a lot about the lack of enthusiasm for the turbulent past, I thought. In the evening, we relaxed in the hotel lobby for a while, listening to the soft captivating music being played on traditional instruments, the khim (a stringed instrument struck with thin bamboo sticks) and the saw-duang (a two-stringed instrument that is bowed like a violin). We found everyone to be very courteous, though the language barrier prevented fuller communication beyond clasping both hands in the Indian-style namaste greeting. Modesty in dress and manners was evident even in the hotel, which seemed typical of the stiff communist societies of yesteryears. Jeans and long hair amongst men are particularly frowned upon. Women mostly wear the sarong-like long skirt (sinh) and blouse, with a broad sash going over the shoulder on formal occasions. Next morning, it was the foreign ministry officials who were scheduled to attend a meeting while we, the forces’ representatives, were to attend a security seminar the day after. This gave me a welcome break for some sightseeing in the city. 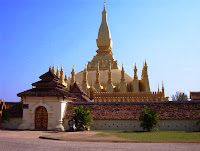 I took a ride on a tuk tuk to the That Luang, the huge golden stupa, which is the most important monument as well as the national symbol of Laos. 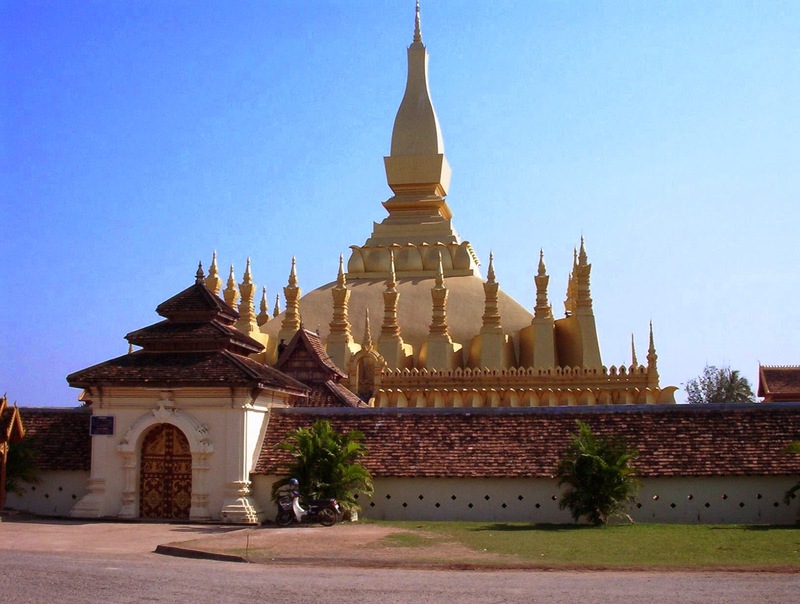 Construction of the stupa was ordered by King Settathirat when the capital was moved to Vientiane in 1566. The stupa was later destroyed during the Thai invasion of 1828 and completely reconstructed a century later. Many tourists had thronged the beautiful parks and open areas around the stupa and were busy in photography, as the monument offers immensely picturesque views. After spending an hour at That Luang and some adjoining monasteries (wats), I took another tuk tuk ride to the Morning Market, a busy shopping area where one can buy just about anything, from fresh fruit and vegetables to electronic goods. Shops and stalls are mostly run by old women while the younger lot is away at work. I haggled for a beautiful inlaid wooden box meant for knickknacks; starting from US $25, the price rapidly fell to $5 as superior Pak bargaining skills took the better of Lao talents. The shopkeeper, a university student, was so excited that he called his mother to inform her of the sale. When I enquired about the matter, he said that the money was enough for the whole family to be able to eat well for a week, so it was important to put the family matriarch in the picture. I was gratefully offered a bowl of sticky rice and fish sauce – the staple food of the Lao – but I declined it as I wasn’t sure about some other ingredients visible on the surface! On the way back, we drove by an imposing monument known as the Patouxai or the Victory Gate, located on the city’s main Lan Xang Avenue. Completed in 1962, the monument is dedicated to the fallen soldiers of various wars. Patouxai’s similarity to the Arc de Triomph in Paris is readily apparent, though Lao motifs and figurines have been used to embellish the structure most aptly. The tuk tuk driver dropped me off near the hotel from where I walked down to the banks of one of the world’s great waterways: the Mekong River. Considering that Laos is a landlocked country, Mekong is the lifeblood of its people. To someone used to seeing our emaciated rivers, Mekong seemed almost in flood. The river bank had scores of small restaurants, but I thought it was safer to choose a kosher fare at the hotel. The sound of flowing waters amidst croaking frogs and chirruping insects in the thick foliage was almost primal. It was late in the evening and I could imagine the reflection of a full moon in the river, a theme so creatively interpreted on the national flag of Laos. As I walked back to the hotel, I wondered if there could be a more idyllic city – almost a cosmopolitan village – where life is slow, everyone speaks softly and, anger seems like an extinct emotion. The third day was busy with a day-long security seminar at which we were uninterested listeners as the subjects had little to do with us. In the evening a cultural show was followed by a farewell dinner. The trip to Vientiane came to a tame end and next morning we left for Bangkok, where we had time for a brief shopping spree. Our ambassador at Bangkok hosted a sumptuous lunch which was all the more enjoyable, as it was peppered with hilarity stemming from some uninformed remarks by the host. His constant addressing of everyone as ‘yara’ (buddy) got the ruddy complexioned Foreign Minister turn maroon, but he somehow managed to maintain his poise. A number of questions by the worthy minister, pertaining to our mission in Bangkok, drew unqualified blanks. Finally, the ambassador confessed in all candour, that being a political appointee, foreign affairs wasn’t quite his forte; hearing this, all eyes popped out much like those of the lobsters in our plates! Thus ended an interesting trip to the laid-back sleepy capital of Laos PDR, where the watchwords could well be: Please Don’t Rush! This article was published in the daily newspaper The News International on 25 December 2011.